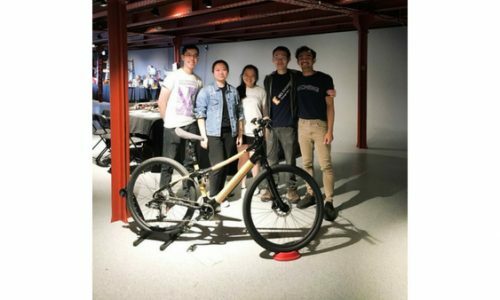 Our project aims to design and manufacture an electric bamboo bicycle suitable for everyday use with older people, women and working professionals in mind. Our goals were for the e-bike to meet the functional needs withstanding up to 100kg of weight at normal cycling conditions, and improving its aesthetics by integrating the battery system. Additionally, the e-bike needed to be lightweight (< 20kg) as many complained that e-bikes were usually too heavy. The design of the bike should be scalable in terms of bike size, weight and quantity at which the design can be mass-produced with a consistent appearance and quality. Sustainability is also considered for all aspects of the process from design to manufacturing and disposal to minimise the impact on the environment. 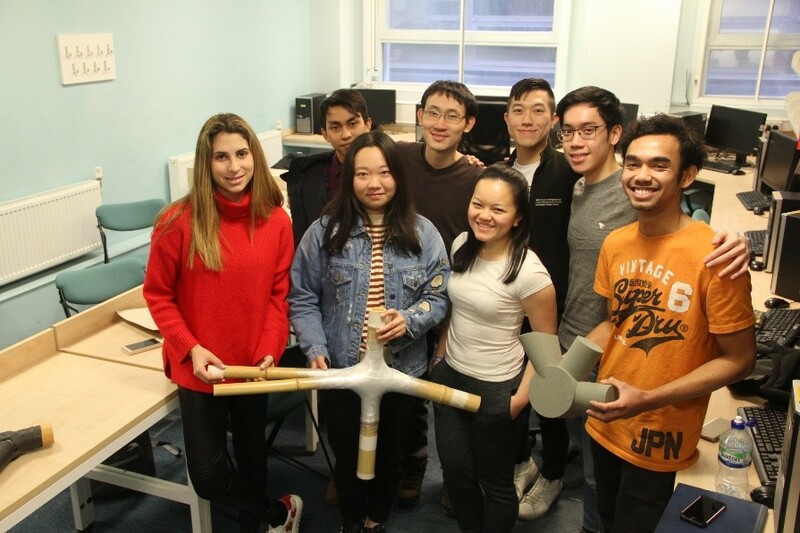 The team also focused on innovating current methods of joining bamboos in terms of strength, time taken during manufacturing, aesthetics (reducing steps needed during finishing) and ensuring sustainability (in materials used). The bicycle has a step-through frame with a well-integrated battery system. 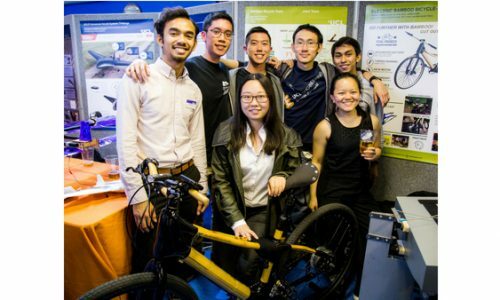 To avoid failures, FEA was used to test bicycle at every stage (the frame, with battery integration, final frame design) to avoid any failure under different cycling conditions. 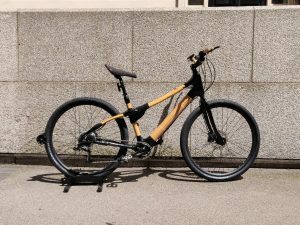 A few new features had been introduced into the bike frame design whereby the parts of the bikes consist of bending bamboos and laminated bamboo handlebar. A magnetic bamboo door is implemented to allow an easier battery removal method without compromising the strength of the bike by using hemp fibre/epoxy composite materials and silicone. 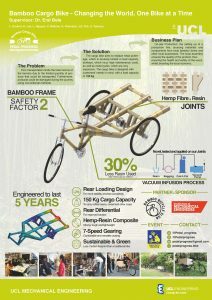 The use of bamboos further improves the sustainability aspects, reduces the weight of the electric bike. The cyclists can have a customised colour for their bikes. 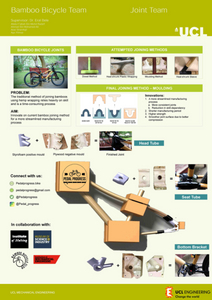 The joints of the bicycle use a moulding method which builds upon the current widely used method of hemp wet lay-up. Moulded joints performed better in functionality or strength, manufacturability as well as aesthetics compared to the traditional method. 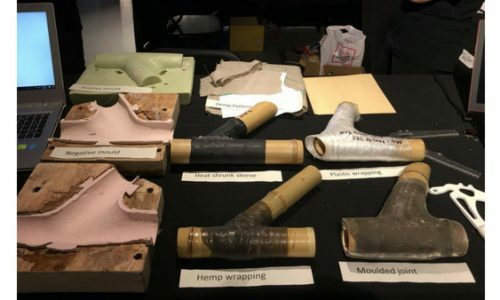 Despite this, further improvements in moulded joints can be made in terms of weight, cost and sustainability.